Since making the switch to digital photography, the number of pictures I take has risen dramatically. I like this. I especially like the idea that they feel "free." No cost for processing, no cost for printing and I get instant gratification when viewing my images. While I know that I definitely don't miss those trips to photo processing stores, I have to finally admit that I don't miss my darkroom either. I used to process and print my own B&W images, but now I am ready to pack up. Maybe Baby will like it when she gets older. Another benefit to getting a digital camera is now I have to ability to bring together a few of my hobby interests, my crafty projects, my DIY dreams. I like to bind books. I have been making my own journals for years and binding these myself with some Japanese binding techniques. This includes a variety of materials including embroidery thread and hemp, cardstock and textured sheets of heavier paper. 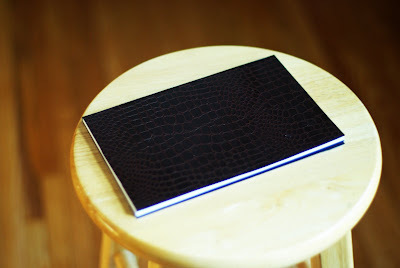 I use white paper for journals, and black paper for photo albums. 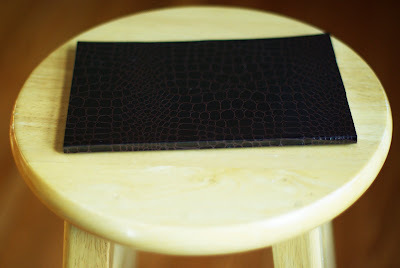 Occasionally I have fantasies about selling these hand-made books, but I never got around to doing that. I always end up giving them away. I used to make them for my freshman seminar class every year and that was a blast to see them pick through the colors to find the exact one that fit their needs. This year I decided to try a different sort of book-binding, a technique that required glue and clamps and such. I found this tutorial helpful. The thing that inspired this evolution in my book-binding skills was the desire to use my own images in a calendar/datebook. I made a 4-month calendar when I started getting involved with the Co-op last August, at a time when I realized I needed something to keep track of pre-natal appointments and co-op meetings. 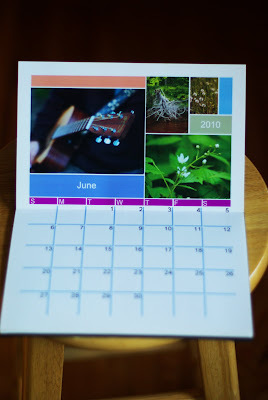 The software that I have prints the calendar pages with four selected images. I like this template because it allowed me to select more than one picture. However, there is not much flexibility in layout, so the final printed pages would not work well if I intended to sew my book together, basically the sewn stitches would have to be worked right on the first row of each calendar month. It took me a few days to work out a technique, even though I was aided by that online tutorial. But, I am thrilled with the results! The binding is slick and tight. I am so attracted to those faux crocodile prints! I am so pleased by this project. 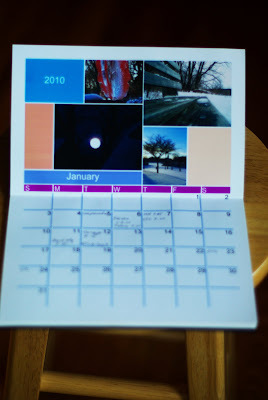 I went through all my pictures from 2009 and selected my favorite four from each month. I am glad that I had decided to organize my pictures that way as that made the selection much easier. Although, I should confess that July and August selections were slim and minimal as I was in a morning sickness fog for both of those months, so not too many pictures to choose from. That's OK, I had plenty in June and September. Speaking of June, this is my birthday month and I think my favorite of all the calendar pages because it has a picture of D's guitar. I did not print these calendar pages back to back. I hadn't thought through my binding technique before printing out my pages and since I printed on photo paper, I did not want to waste what I had. In bringing together the pages for binding, I decided that a blank pages in between calendar pages would come in handy for notes and to-do lists for each month. 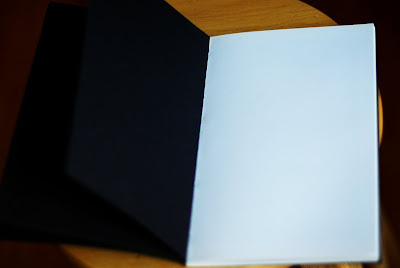 Towards the end of the datebook, I added ten pages of black paper so that I could paste in favorite pictures from the year to come. What else can I say? Dang, I feel proud of myself. Not only in the final product, but also in that I brought two on my craft interests together so beautifully. It's a useful DIY project and that's probably the best thing about it all. So, I've been thinking I should maybe get my own Etsy store with some of my book binding projects, my photo projects (I've been thinking about making postcards and greeting cards), and maybe even some of my knitting projects. A little bit of extra cash would probably help cut the cost of materials. 2010 already feels full of new possibilities! Your notebook is lovely. I've really enjoyed having my etsy store & that little bit of extra cash. If you do start one you should join Handmade MN, a collection of MN artists & crafters with etsy stores. Thanks, Kat! You are such an inspiration to me. I love seeing all that you do and all that you are involved in. I get so many ideas from you and hope that this doesn't annoy you, and hope that you find it flattering!